If you own or market a business, you probably have (or know you need to have) a brochure to hand out at business events and trade expos or mail to prospects. Brochures tell your story, describe your company’s vision, list your capabilities and hopefully help you close sales. And because everyone including your competition has one, your brochure should convey your brand and stand out in the crowd. Here’s how. Think BIG: Opt for an oversized piece. 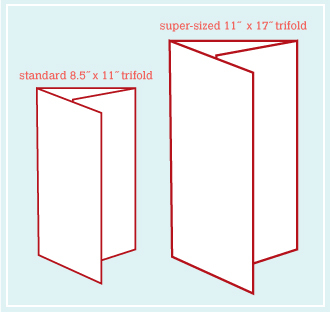 A standard brochure is 11″ x 8.5″ when unfolded, but you could go as big as 17″ x 11″ or larger. Printing companies are catching onto this trend and catering to the idea that bigger is better. Large pieces allow you to use more or larger photos and branding elements, and give you more flexibility in design. Plus, among a sea of sales pieces your brochure pops! 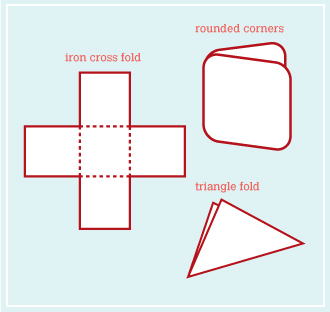 Fold in a fresh way: Illustrate how exceptional your business really is! Rather than a tri-fold brochure, try a single horizontal or vertical crease to create a finished size that stands out and makes your brand more memorable. Rework the rectangle. Consider creating a brochure that’s square or round. Printers often have pre-made dies in several sizes to round corners or cut a custom shape that can add character to your design. Book it. Hold the fold altogether. 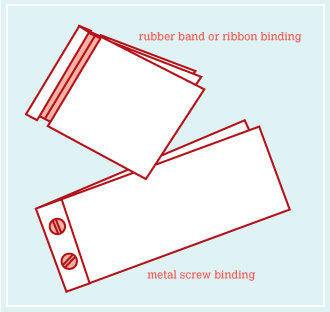 Instead, print individual pages and bind them together. Choose a material or method that supports your brand. Hardware like eyelets, brads or screws would work well for manufacturers, building contractors, and brands that mean business. Ribbon and twine for caterers and chefs, interior designers and companies with an organic, softer side. Or maybe something flexible like rubber bands or decorative paper clips for brands that are playful or young at heart. Add a layer of good looks. Attach a CD, business card, or sticky note. Include a pocket or two stuffed with samples or photos of your work. Perforate a page for prospects to return to you. Or place the brochure in a colorful or uniquely-sized envelope. Little extras go a long way in catching (and holding) the attention of an admirer. Are you ready to rethink your brochure? Call us at 612.226.5717 or email us to discuss your project and review our portfolio of ideas! Need for brochure info? Check out our post, Found: An Equation for Calculating Trifolds! SAW AN INTERESTING BROCHURE SHAPE? TELL US ABOUT IT! LEAVE YOUR COMMENTS BELOW. . . This entry was posted on Wednesday, September 24th, 2008 at 1:20 pm and is filed under Design Tricks and Tips, Marketing your Business. You can follow any responses to this entry through the RSS 2.0 feed. You can leave a response, or trackback from your own site.